Generally speaking training for a road race involves 3 to 4 basic workout types, each with a specific objective. Could aerobic fitness link with learning? This research says YES! Growing evidence suggests that aerobic fitness benefits the brain and cognition during childhood. 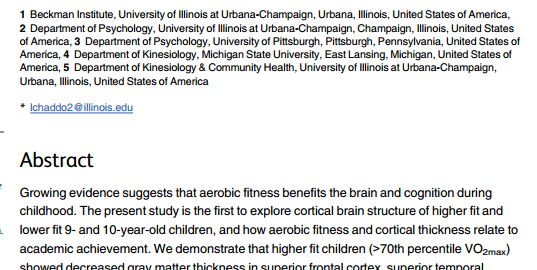 The present study is the first to explore cortical brain structure of higher fit and lower fit 9- and 10-year-old children, and how aerobic fitness and cortical thickness relate to academic achievement. We demonstrate that higher fit children (>70th percentile VO2max) showed decreased gray matter thickness in superior frontal cortex, superior temporal areas, and lateral occipital cortex, coupled with better mathematics achievement, compared to lower fit children (<30th percentile VO2max). Breakfast really IS the most important? Are you faster than a horse? Maybe. Humans are not faster than horses…..but they can beat them in races if they work hard and learn how to grow their strengths…..here’s a story about a race that proves it. Knowing how hard to exercise is important for both results (intensity is an important factor in exercise “dosage”) as well as for enjoyment. “No pain, no gain” often makes no sense…. This is not to say that pushing hard is not appropriate…it absolutely is….but like most things, it’s not an either/or. Understanding and maintaining balance ensures the experience is positive AND the best results can be achieved. The Rate of Perceived Exertion (RPE) is a valid way of assessing exercise intensity. However the adult version may not be most appropriate for kids. 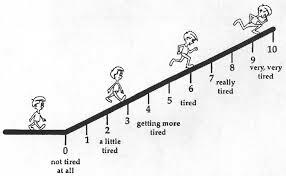 The OMNI is a validated tool which allows children to rate their effort on a 0 to 10 scale using pictures. Click HERE to read the full study.